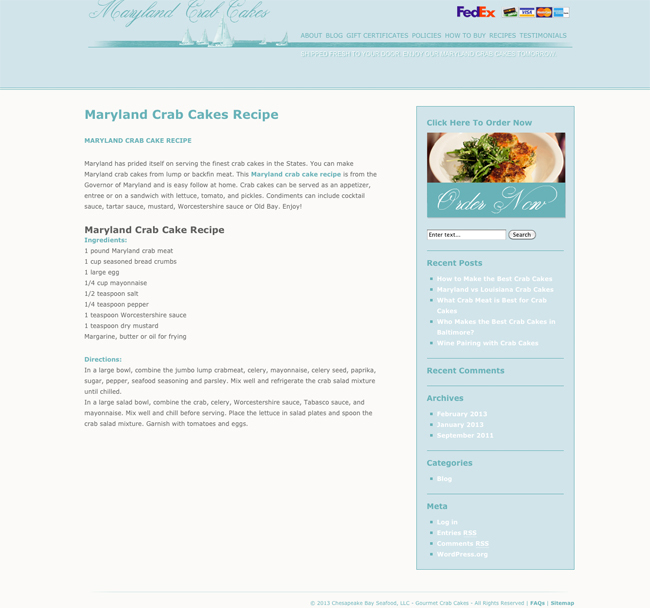 Maryland Crab Cakes is a highly popular site offering customers online crab cakes. 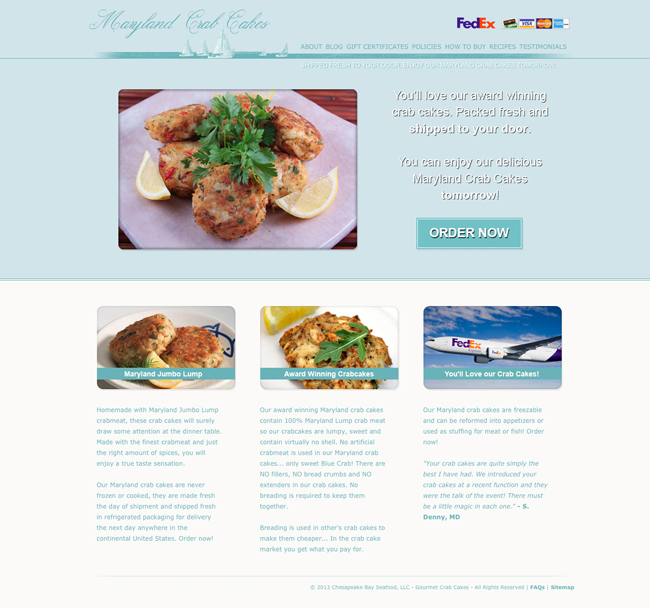 Their business offers next day delivery of fresh crab cakes out of Marlyand, all containing 100% lump crab meat and no artificial ingredients. 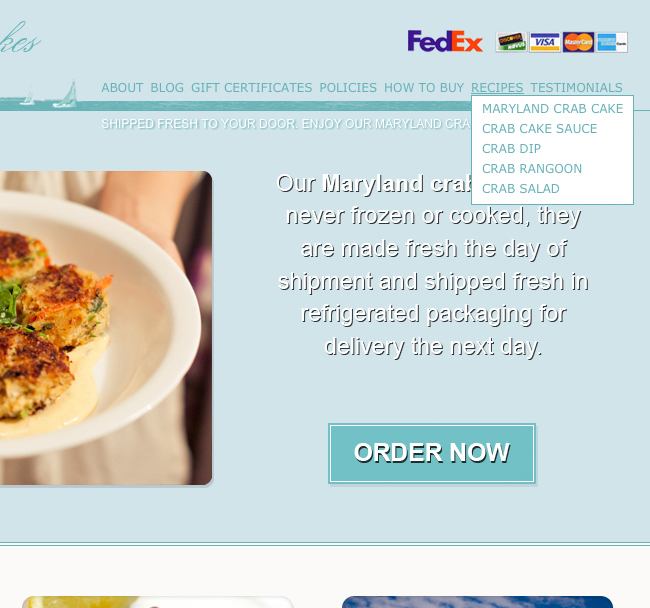 They never freeze or cook their crab cakes, so it is of the freshest quality. 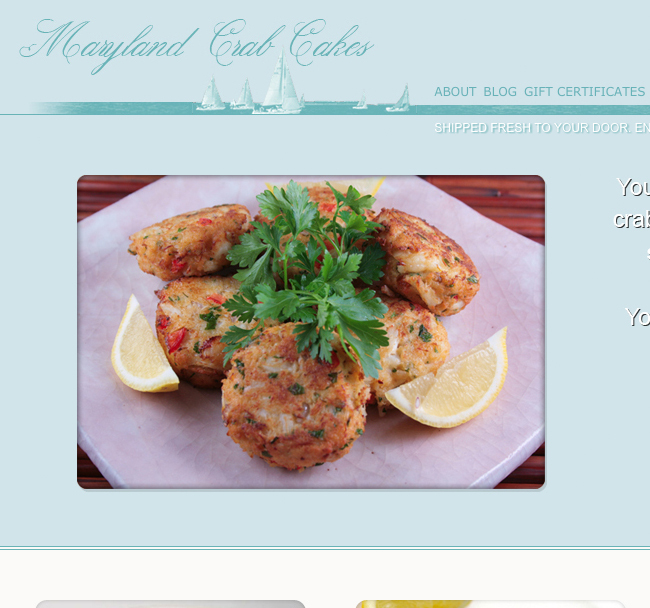 I developed a WordPress based site for Maryland Crab Cakes. From their logo to the light, fresh color scheme, I focused on an elegant feeling to set their business a step above their competitors. Clean, scripted lettering, sailboats and subtle lines blend with the refreshing blues. Much thought was put into using shades of blue that would define their brand, giving it a characteristic and yet comfortable feeling. An image slider in the header of the front page provides catchy, immediate imagery, as well as the core selling points of their business. 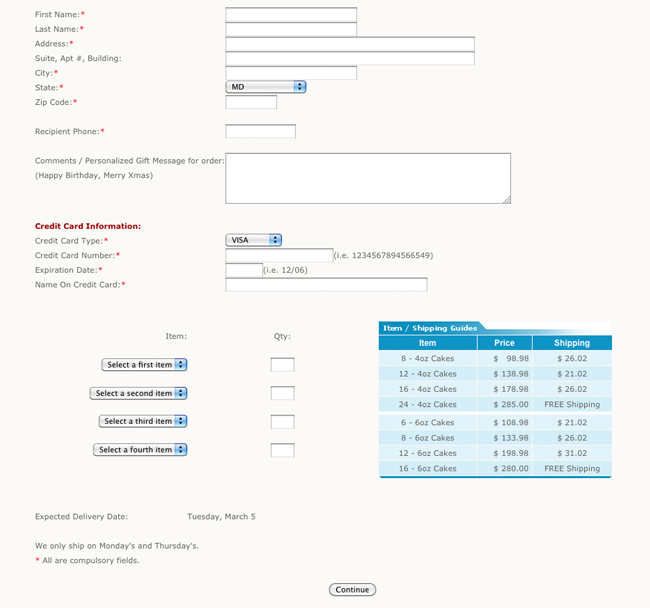 The elegance of the site is cleanly organized, everything kept very simple and easy-to-use. 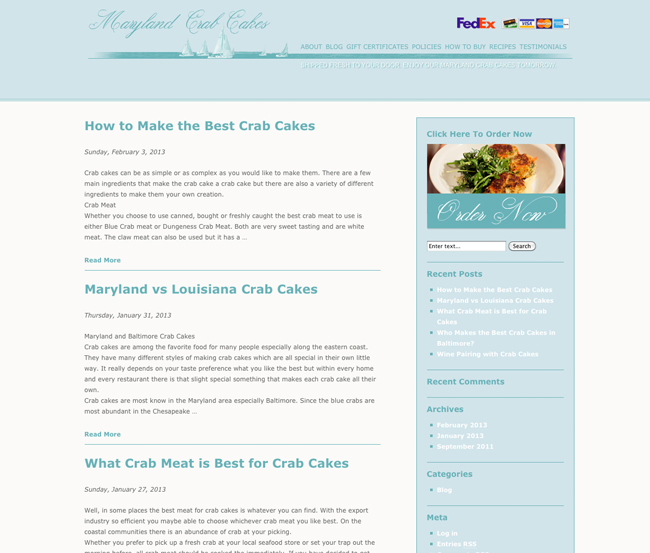 Site visitors are able to make advanced check out orders, read their blog, recipes, and other information on crab cakes. I also oversaw the development of all of the blog content, from planning out the articles to editing the writer's work. 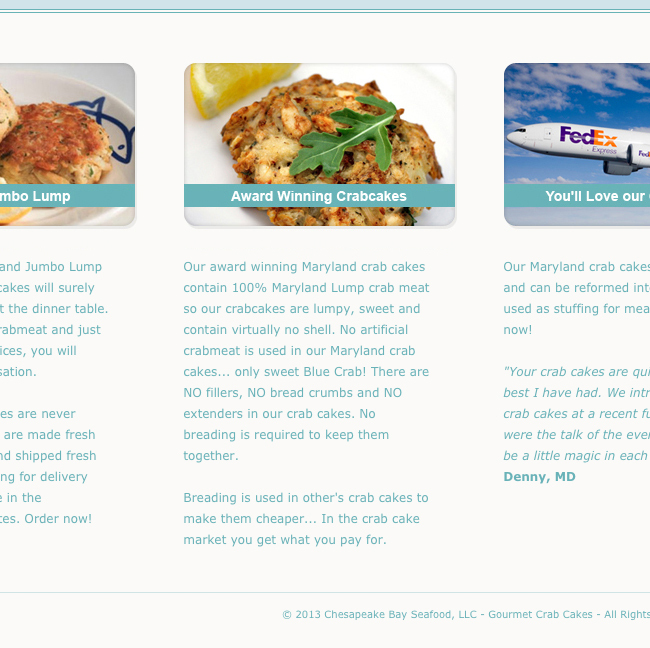 My concept was to make the site personable and full of relevant articles on crab cakes.